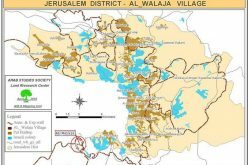 On November 07, 2016 dozers of the Israeli occupation army demolished a carwash in the neighborhood of Al-Jib, northwest Jerusalem on the claim of "unlicensed construction". 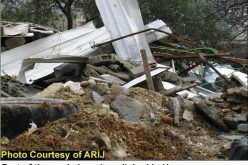 Additionally, the attacking force confiscated some equipments from the carwash and demolished a caravan and a foundation owned by citizen Mustafa Alqam.
" The carwash was constructed in 2011 on a total area of 60m2; nine workers live off of it. 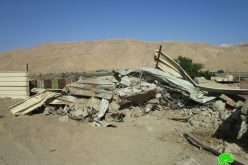 After the construction was done, members of Israel Civil Administration arrived at the location and delivered us a demolition order after photographing the structure. At time, I sought an attorney to defend my case in Israeli courts. 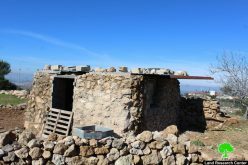 One day before the demolition took place, the attorney was informed of another demolition order on the structure. 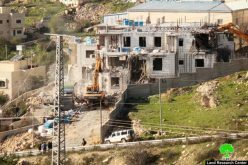 At eight in the morning of next day, a massive force from Israel Police accompanied by two dozers arrived at the location, encircled the carwash and embarked on the demolition operation. We were banned from approaching the structure and even saving any of the equipments left inside. 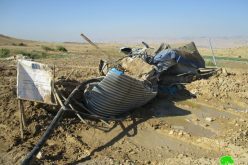 The dozers ravaged the land, on which the carwash is established and demolished a container that had items worth of 4000 NIS in it. 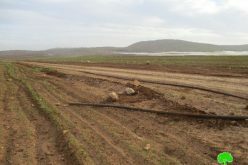 Also, the force's soldiers confiscated water pumping equipments with the cost of 12,000 NIS. The demolition lasted until ten in the morning. The Civil Administration obliged me to clean the rubbles otherwise I get fined, which I did by the end of the day".